Samantha Barks is a Manx actress and singer. She is best known for her role in the 2012 musical film "Les Misérables". She released her debut album in 2007, named "Looking In Your Eyes". She has been nominated for a Screen Actors Guild Award, a London Film Critics Circle Award and she has won a National Board of Review Award for Best Cast. She was born in The Isle of Man in 1990. She is a vegetarian. She is a trained dancer in ballet, modern and tap dance. She has dated singer Richard Fleeshman in the past. 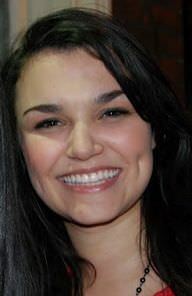 Samantha Barks is a famous Manx actress and singer, who was born on October 2, 1990. As a person born on this date, Samantha Barks is listed in our database as the 4th most popular celebrity for the day (October 2) and the 7th most popular for the year (1990). People born on October 2 fall under the Zodiac sign of Libra, the Scales. Samantha Barks is the 32nd most popular Libra. In general, Samantha Barks ranks as the 411th most popular famous person of all time. “The Famous Birthdays” catalogs over 25,000 famous people, everyone from actors to singers to scientists to serial killers and more. If you're curious to see who was born on your birthday, you can use our database to find out who, what, where, when and why. You can search by birthday, birthplace, claim to fame or any other information by typing in the search box, or simply browse our site by selecting the month, the day, the horoscope, or any other clickable option.